- by Jeremiah, with contributions from A.J. and Sepos. 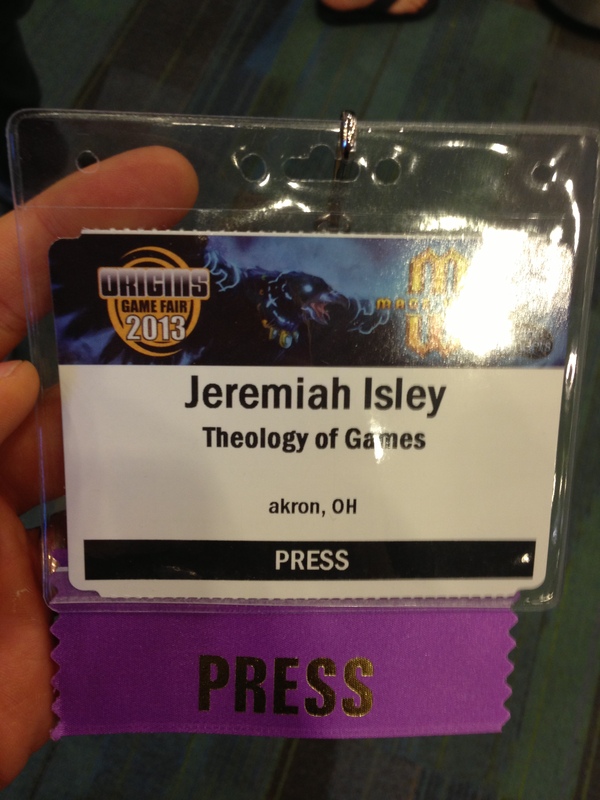 Last Friday we made our way down to Columbus and the Origins Game Fair, to cover the con as best we could for the blog—in just one day. The con featured everything you'd expect from an event of this caliber: tons of seminars, officially supported tournaments and game play, an Unpub gathering, and of course, the exhibit hall featuring hundreds of vendors, publishers, and more. We made our way through, and shot nearly two hours of video content, featuring interviews with Paul Peterson, Jason Tagmire, Kevin Sorbo, and many more! As you would expect at a large-scale gaming convention there were a ton of great games, as far as the eye could see; we'll highlight some of the games we thought were of note over the next couple days. The Duke—An Origins-released game, convention-goers were among the first to demo and purchase The Duke from Catalyst Game Labs. The Duke is a tile placement/tile moving, chess-like strategy game for 2 players. Each tile represents a different troop defending your Duke: Move a tile and flip it to show the different movement now available to that tile. The game plays fast but has massive replay value as it is tough to master, and different every time! Council of Verona—Crash Games is currently Kickstarting this title as the flagship to their Pub Series of games. Council of Verona is a card-based strategy game with a very strong bluffing component. The Pub Series is a catalog of games that are compact enough to play anywhere, but still offer great depth in their gameplay. You can get in on the Kickstarter until July 3rd, and it's only $12 to get a copy delivered to your door! Dice Hate Me lineup—Last year Dice Hate Me Games had a booth that pretty much consisted of one game: Carnival. This year they're celebrating a successful release of The Great Heartland Hauling Co., as well as VivaJava, and they're looking forward to the upcoming release of Compounded, VivaJava Dice, and Belle of the Ball. Chris Kirkman has been putting together a great lineup of titles using a stable of unknown/first-time designers to bring great and well-designed/developed games to market. We're excited to see what's coming from them next! Dungeon Heroes—This exciting game brings you the full experience of a dungeon crawl in a quick-play style. This vs. game pits your heroes against a dungeon player who will try and thwart your efforts to collect hidden treasures. The game board is grid-based with miniature meeples as your characters, who move, attack, and defend based on character abilities. Most importantly, the game can be played in 15 to 30 minutes, giving a busy gamer an opportunity to participate in a fast-paced dungeon crawl. The game is completely expandable and will hopefully offer a multi-player aspect to the game as well as larger game boards. This game looks fantastic and has done great on Kickstarter. We'll be keeping an eye on its future. 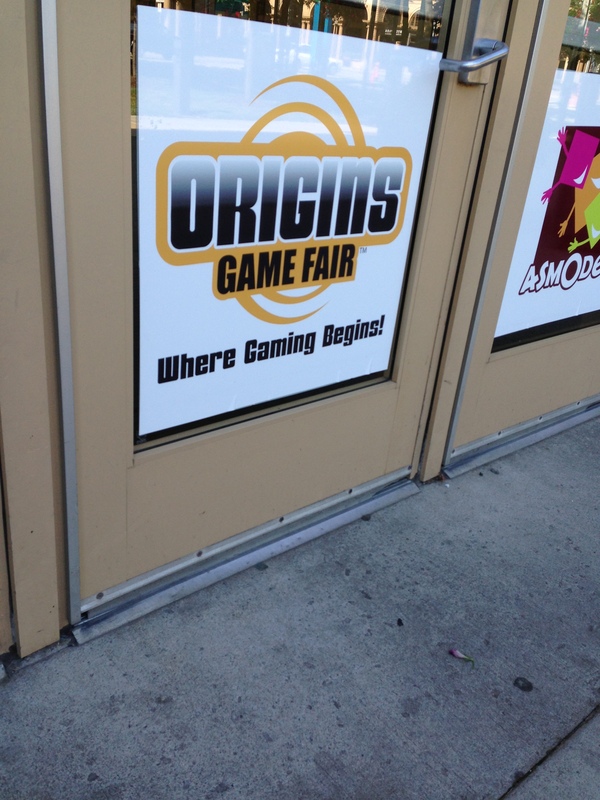 We'll be sharing more about Origins over the next few days, not too mention all of our awesome video coverage! For more about Origins, and some good old fashioned social-media fun, look for TOG on Facebook, Twitter, and Instagram. Don't miss a single TOG post! Subscribe via email over on the right!